Local hockey fans might not know Nico Sturm, the 6-foor-3, 23-year-old center who signed with the Minnesota Wild last week. A native of Augsburg, Germany, Sturm spent three seasons at New York’s Clarkson University. He arrived in North America in time for the 2013-14 season after playing youth hockey in Germany, spending 21 games with the NAHL’s Corpus Christi Ice Rays. Sturm landed in Minnesota the following season, spending 2014-15 with the NAHL’s Austin Bruins. A 24-team Tier 2 junior league overseen by USA Hockey, the NAHL has three teams in Minnesota: The Bruins, the Minnesota Wilderness (based in Cloquet) and the Minnesota Magicians (based in Richfield). Sturm was among the Bruins’ leading scorers, finishing with 41 points (11 goals, 30 assists) in 53 games. Several members of that Austin squad ended up with Division I programs, including Minnesota State defenseman Ian Scheid and Minnesota Duluth forward Jade Miller. Sturm moved on to the USHL the following season, finishing seventh on the Tri-City Storm with 39 points (14 goals, 25 assists) during the 2015-16 campaign. He crossed paths with a potential future teammate in the USHL: Providence College forward Brandon Duhaime, a fourth-round pick of the Wild in 2016, who was traded from the Chicago Steel to Tri-City midseason. 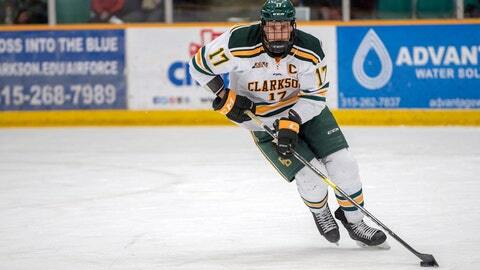 A productive player in juniors, Sturm broke out at Clarkson, developing into a point-per-game player and emerging as one of the league’s most intriguing undrafted free agents. Sturm was held off the scoresheet just seven times as a junior during the 2018-19 season, leading the Golden Knights and finishing second in the ECAC with 45 points (14 goals, 31 assists) in 39 games. A top-10 finalist for the Hobey Baker Award, Sturm was also named the ECAC’s best defensive forward for a second time. He opted to return to Minnesota following his junior season, signing a one-year, entry-level contract with the Wild. From general manager Paul Fenton’s point of view, it’s not hard to see the appeal: Sturm has a little of longtime Wild captain Mikko Koivu in his game, and fits in neatly with the rest of the Wild’s young forwards. Luke Kunin and Jordan Greenway are 21, while Kevin Fiala, Joel Eriksson Ek and Ryan Donato are 22. However, that contract isn’t as simple as it sounds. First, some background: The older the rookie, the shorter the rookie contract. A player who signs before turning 21 gets a three-year deal, while a player who signs at 22 or 23 gets a two-year deal, all with a maximum annual payout of $925,000 or less. Under that system, Sturm, who turns 24 next month, gets a one-year, entry-level contract. The twist: That year starts now, making Sturm a restricted free agent July 1 and freeing him up to sign a better contract this summer. That sets up a win-win: The Wild add another promising forward to their young core, and Sturm gets to sign for something closer to his actual value. With two games to go in the regular season — Thursday vs. Boston and Saturday at Dallas — the Wild should get a better sense of what that is soon.